Home » Blog » Boulder White Clouds Passes Congress! Boulder White Clouds Passes Congress! Today, the Boulder White Clouds bill passed the Senate Floor by unanimous consent! This final action by congress sends this long sought after Wilderness bill on its way to the President’s desk for signature. This is an historic day for the Boulder White Clouds, an area clearly deserving Widerness Designation. It’s also an historic day for the Idaho Delegation as they came together to craft and support an Idaho Vison for Wilderness. Both Senator Risch and Crapo extol the magnificence of the Boulder White Clouds and give high praise to the leadership and vision of congressman Simpson. For FSPW this is an important milestone. In the May Senate Committee hearing about the Boulder White Clouds, Sen Risch spoke about the Scotchman Peaks as the next likely candidate for Wilderness from Idaho. Both the Senator and his staff have indicated interest in working with us on a Scotchman Peaks Bill, after the Boulder White Clouds Wilderness is signed by the president. We expect the president to signt he bill in the next few days and that our day will be coming soon. We don’t have a timetable, and there is much work to be done, but by all indications a bill designating the Scotchman Peaks as Wilderness will take far less time than did the long route taken by the Boulder White Clouds. As we celebrate all this moment means, and as we plan ahead to the future work to be done, please click here or on the link below to send thank you’s to both Idaho Senators for today’s historic vote! Are the Friends group, friends to all who use the trails, i.e., dirt bikes, atv’s, snowmobiles? Or is it strictly hiking? FSPW is about Wilderness. Recreation is only one aspect of that. Wilderness areas are places for more primitive forms of recreation, non-mechanzed. Other places on our public lands are more appropriate for other types of recreation including dirt bikes, atvs and snowmobiles – our supporters, or friends, are people who support this balanced approach to land management and use. The Boulder White Clouds area was already protected as a National Recreation Area and the wilderness area boundary was drawn to allow all continued access for motorized users so effectively the only change is the closure of decades old mountain bike trails. The mountain bike community supported either a boundary that would have preserved the bike trails (as the motorized access was preserved) or a National Monument that would have been much larger and allowed bike trails in appropriate locations. What assurance is there that FSPW won’t take a similar approach and seek to bar human powered recreation (or confine it only to roads)? Can you give any reason why mountain bikers (including those whose disabilities and abilities make bicycles their only reasonable way to experience wilderness) shouldn’t offer their whole-hearted support to groups like the Blue Ribbon Coalition who advocate for more access (albeit usually shared with motors)? 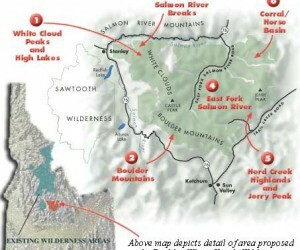 The “Boulder White Clouds” Wilderness bill covers a large landscape, with significant portions that lie outside of the National Recreation area. The National Monument proposal was much larger than the final Wilderness, almost twice the size. All three designations – National Rec, National Monument and Wilderness, do, or would, cover different parts of the Sawtooths and surrounding landscapes with different management options administered by both the BLM and the Forest Service.The final bill was a compromise which will be viewed differnetly by many folks with different opinions, but in the end the Idaho Congressional delegation found this approach to be the best compromise. 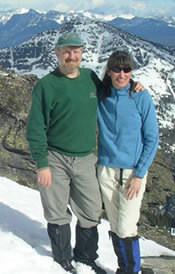 As for the Scotchman Peaks – the landscape is much smaller and far less complex. Currently, the area recommended by the Forest Service for Wilderness designation is already closed to mechanized recreation (motorized as well as mountain bikes). Congressional designation of the area as wilderness wouldn’t change that, it would continue to be managed that way. FSPW supports a balanced approach to the question of land managment with the belief that the Scotchman Peaks should be wilderness and that other areas of the National Forest can provide for the multitude of other uses including motorized recreation as well as areas for mountain bike trails. We encourage people to belong to organizations that support a balanced approach to land management and which recognize the value of wilderness as well as the value recreational access for hikers, equestrians, mountain bikers and motorized users. Our staff is always available to answer questions and explore these issues in greater depth. Anyone who is interested in conversation about the Scotchman Peaks, can reach me directly on 208-946-9127.